“Urban chic with a rural feel” fits to describe the Splash Spring/Summer Collection 2010. The high end runway fashion show so far was the best, a retail merchandize that started with just one store in 1993,and is now one of the leading retailers in the Gulf with Dubai as it’s headquarter and a retail network of 63 Splash stores and 54 brand stores across the region. Splash showcases popular in-house collections for men and women such as Ms, Nexus, Maxim, Retro, ZYNC, and Scarlet, with international brands such as Maui and Sons among others. The elegant Madinat Jumeirah hosted the fabulous evening to Dubai’s fashionistas,style sets,fashion editors, bloggers and fashion wannabes. Splash sets the trend not only on its going to- the- top style agenda but also on its commitment to showcase the developing brand repositioning to higher level. The show started a little bit late, a loop that made the night more stylish and glamorous. The crowd simply love the rounds of unending bubbling champagne with ladies bursting every corner flaunting and flashing their outfits and arm candies. Men retreated to the sides giving a complete exposures to a total girls night out…their moments to shine. The contemporary stage complete with american Indian’s tepees and rolling plains denotes a free-sprited movements and migration, the recreation of the Old West. The first phase of the collection was trendy and urban, with Dolce & Gabbana stting the trend. The models showed a metropolitan cowboys..carefree and sprited in washed jeans and leather boots, plain tops, plaids, boleros and vests. Ranch hats and lassos on hand completed the wow factor. The leather bustiers fused with cotton eyelets in white, lined stockings and boots set the hacienda inspiration of the trend. The second part of the collection is what SPLASH is all about,T-shirts and jeans for the young and the high octane individuals.The collection was strong and edgy…sometimes rebellious and flashy.The girlie short dresses were almost lost in the middle, with no focus of colors, the undefined silhouettes and the retro trends were almost unwanted part of the presentation…in the end anyway the clothes were practical wardrobes intended for the young sets. 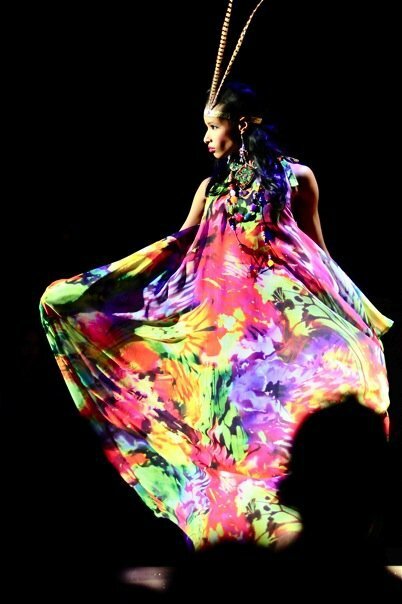 The lounge wear collection was a a feast, done in bold prints and colors the A-line cut long dresses were relax, airy on summer evening’s romantic moods. The styling of exotic feathers as head pieces made the total look vibrant and spicy,to an outright minimalist wardrobes. Over all, the production was high and world class with Bong Gerrero’s BRAG and his team doing a great job. The collection was remarkably very pret-a-porter,nd I am leaving few spaces for improvements next season like focusing of one major trend, colors and cuts. Another five thumbs up for Splash’ CEO, Mr. Raza Beig who was brimming with pride as he closes the runway show as the rounds of applause from the crowds boiled to one word…Success!!! thankyou is all i can say…we sincerly try and hope the customer and audiance sees we are making a change,bong play a important part and share our sucess and failure…as i tend to give him the business i also give him all my headacke..